Stitch All Day | Keep calm and stitch on. No really, how did that happen? Work has been ridiculously busy. As far as I’m concerned, it feels like it’s still sometime in June, but when I turned around the summer was half over. First of all, how about some WIPocalypse questions? It’s been so long since I checked in that I’ve forgotten how to spell WIPocalypse. Reality or Fantasy. 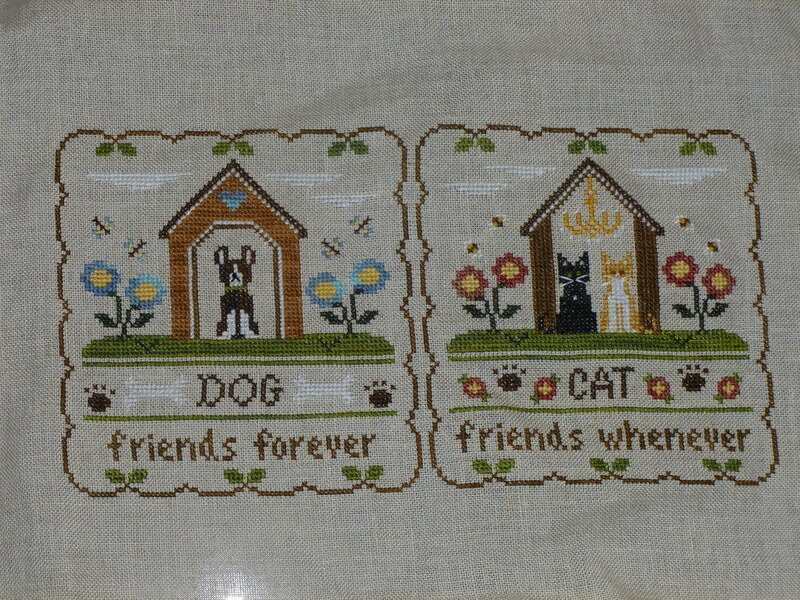 Which do you prefer to stitch? Figures or Abstract? I’m kind of in the middle on this one. I prefer to stitch recognizable motifs, so we’ll call that figures, but I prefer my pieces to be more abstract than a realistic scene. Serenity Harbor does not remotely fit into that, since it’s definitely a full scene, but the majority of things I stitch are more abstract samplers. I always bookmark pretty, realistic patterns, but I usually don’t pursue them because I know they’ll take forever and a day. Jumping back to June, Do you find yourself more productive with stitching in summer or winter? Definitely winter. It seems like I never have free time in the summer, and when I do have time off I’m just exhausted from work. Life is a little slower and cozier in winter, so I find more time to stitch (as opposed to collapsing in front of Netflix in an exhausted heap). 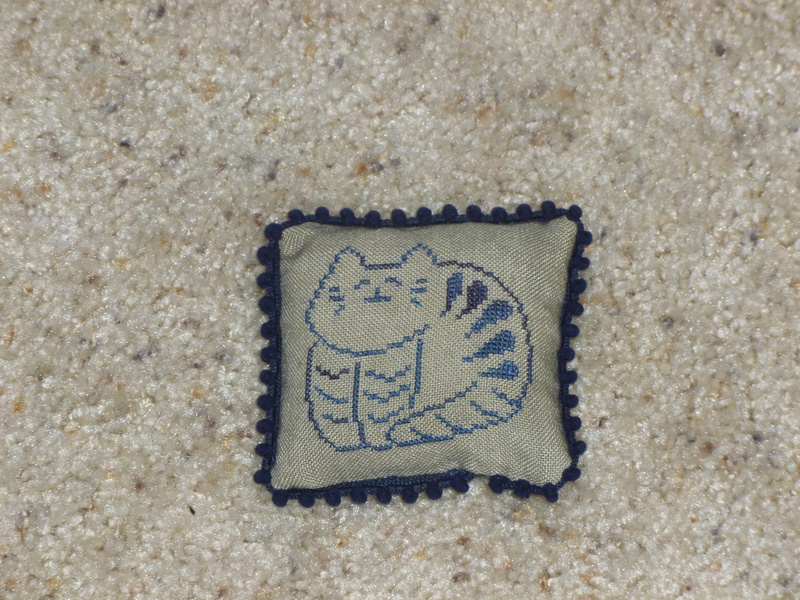 So how does the stitching look? I still haven’t finished the border on Sea to Shining Sea. I started the June block of Story Time (Peter Pan) but haven’t picked it up since June 3rd. I think I’ve stitch Peter’s shirt and that’s about it. I’ve added about five stitches of water to Serenity Harbor, so I’m still working on May’s stitching. That sampler is pretty solid all the way to the bottom, so I bet I don’t catch up. Personalized a touch for Dante, Elihu, and Marvin. I did finish Furry Friends. 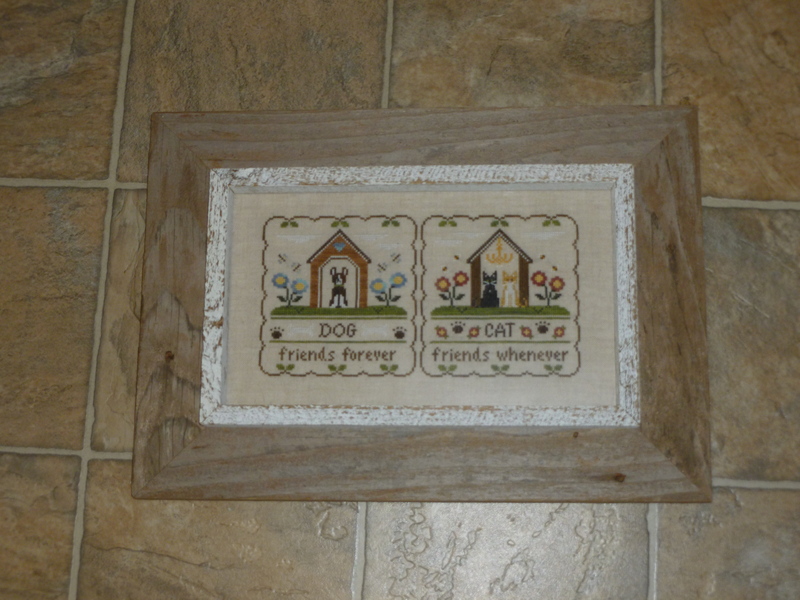 This is by Country Cottage Needleworks, with a few personalized changes. I also changed the color palette so it’s less pastel. I actually meant to take the blue a few shades darker, more of a royal blue, but oh well. I stitched this for my brother’s birthday; the stitching was finished in time, but the framing wasn’t. Better late than never. Believe it or not, but that frame did NOT give me splinters. I’m pretty surprised. As far as I know, my brother isn’t into crafts, but this was well received. I generally don’t stitch gifts, so this was a pretty meaningful piece for me to work on. A start and a finish. This is Strawberry Bunny from Just Nan. 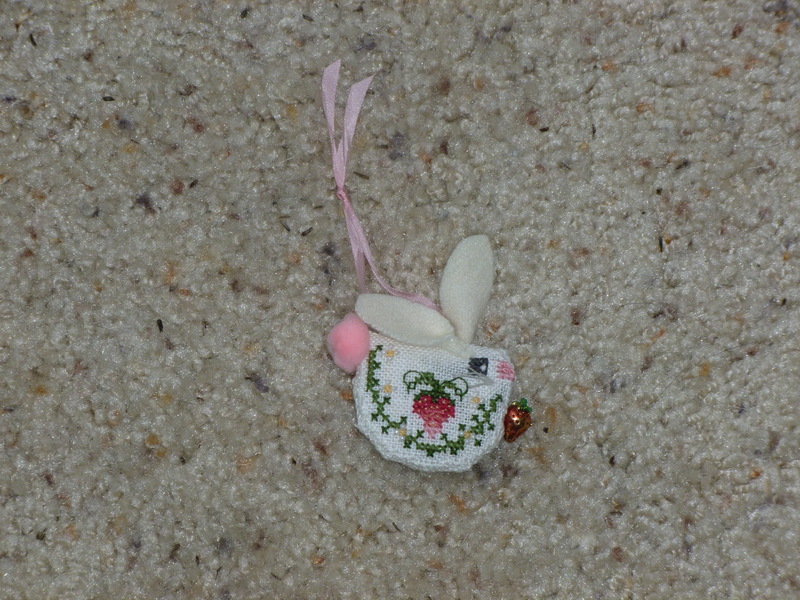 I have a bunch of Just Nan ornaments in my stash, and it’s about time I started on them. The berry charm is pretty heavy, so this is not weighted evenly. I haven’t quite figured out how to hang it up yet. The pattern has instructions to mount it on a spool, so I may go that route. I have a little wall box for smalls like this, but I’m not sure the spool would fit. Here’s the first of five parts of Santa’s Cabinet from SamSarah. I just got the hanger today (not that I’ll need it for a few more months). I think the next part comes out in August? I’ll know it’s time to start stitching again when it suddenly turns up in my mailbox. Merry Christmas! So any guesses on if my stash is growing or shrinking as I stitch things? 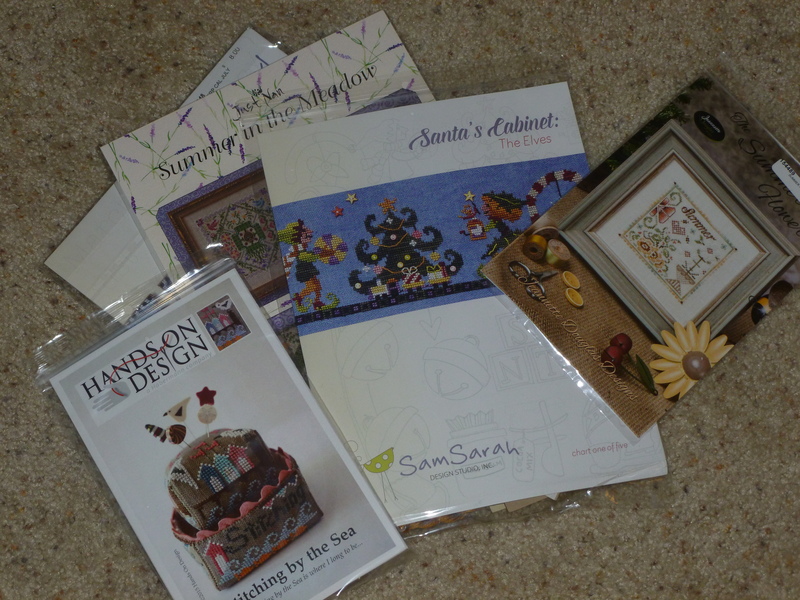 Silver Needle had a grab bag sale for Little House Needleworks. I love Diane’s work and have little willpower, so here we go. Seems like we’ve been here before. 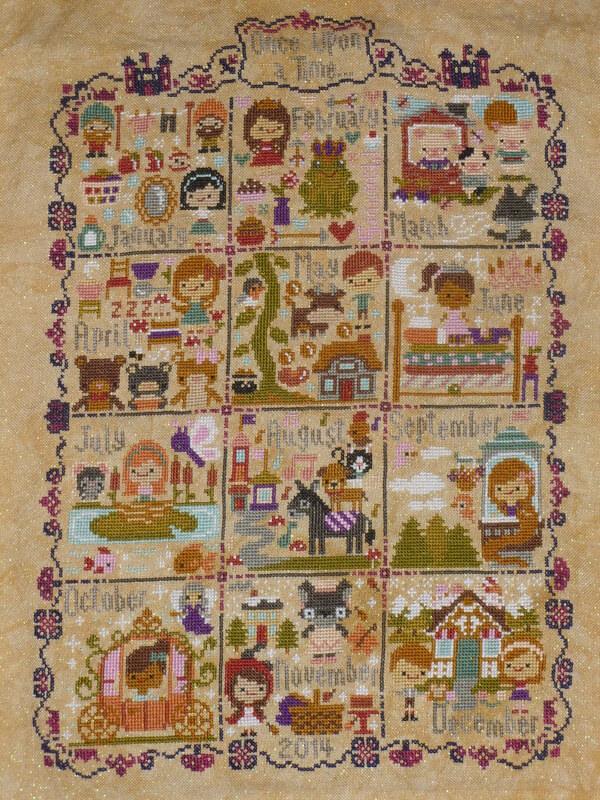 I’m also tackling Fun Every Day, the perpetual calendar SamSarah put out a few years ago. 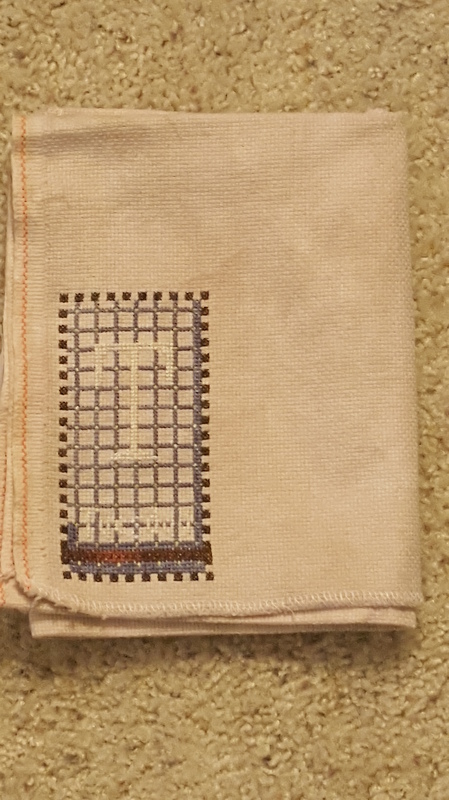 I tried stitching on the perforated paper, and it just did. not. work for me. These tend to have large, solid patches of color, which leave plenty of room to play with overdyed floss, hence the grid pattern up there. Once I fill it in, you’ll still be able to see the individual blocks in some places. Change it up a little so you don’t just get stripes. So there you have it. 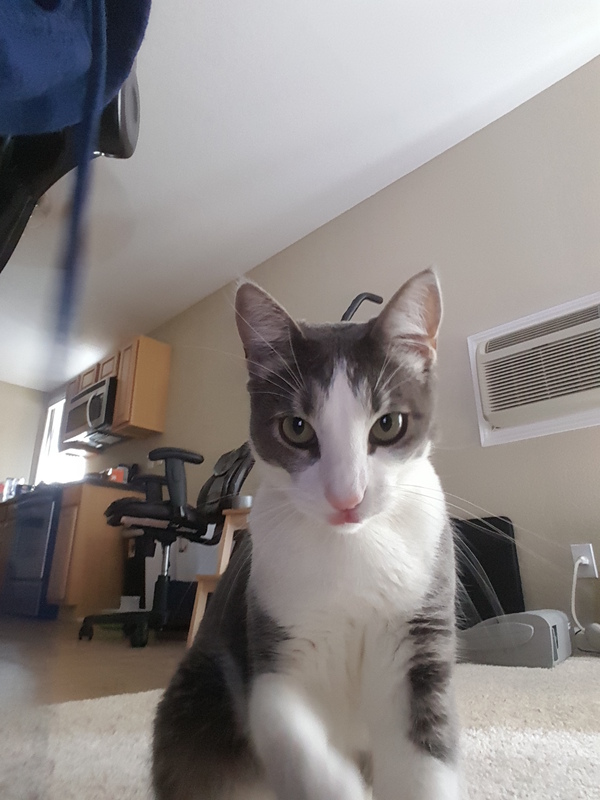 Do we need a cat picture? I think we need a cat picture. 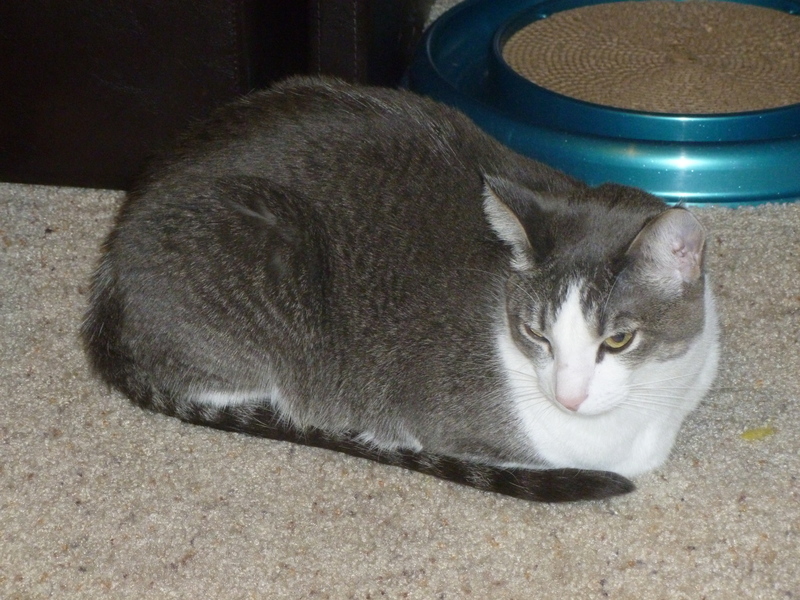 Here’s Morty ready to strike. So life has gotten complicated lately. Some big changes are on the horizon, but I’ll push through it. I’m still stitching; it’s my happy place. Here’s the run down of my progress since my last post in March. Stoneware Cat by Priscilla’s Pocket, released at Nashville. 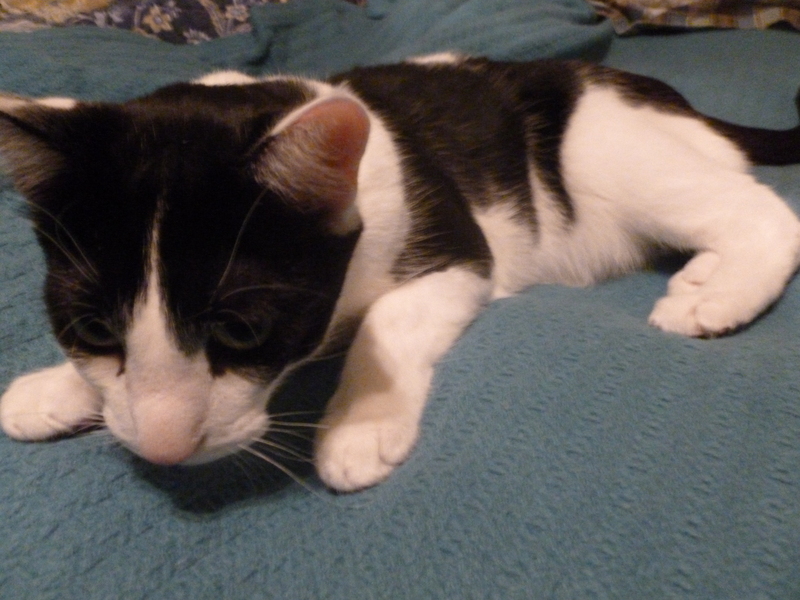 My Cat, a freebie from Giulia Punti Anitichi. The button was on sale at Nashville. Now how about some in progress shots. 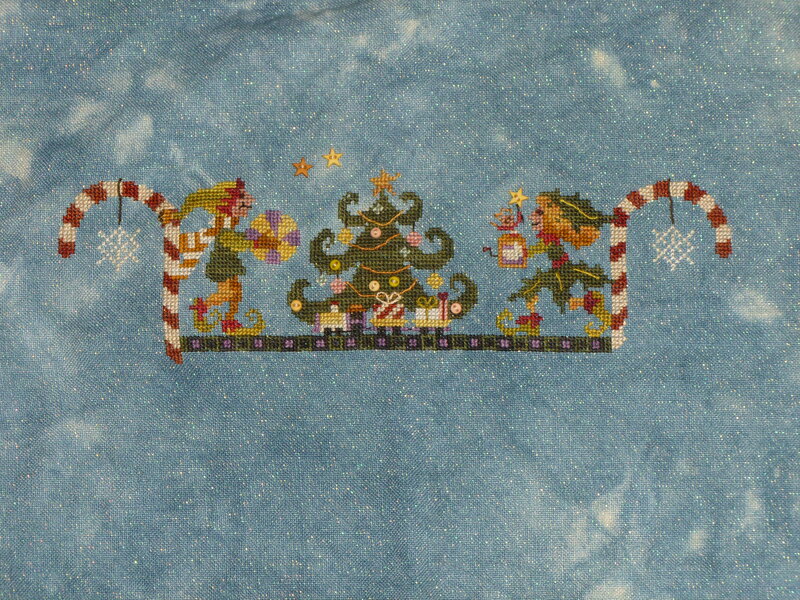 From Sea to Shining Sea, floss pack from Classic Colorworks and design by Little House Needleworks. I still need to do the border, and then this one will be finished! 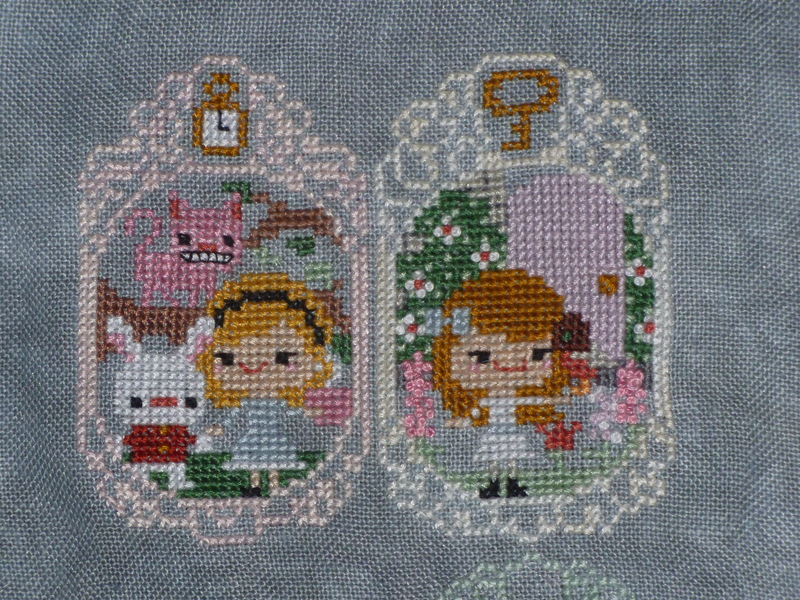 Not the best picture, but I’ve finished five months of the Story Time Sampler from Frosted Pumpkin. 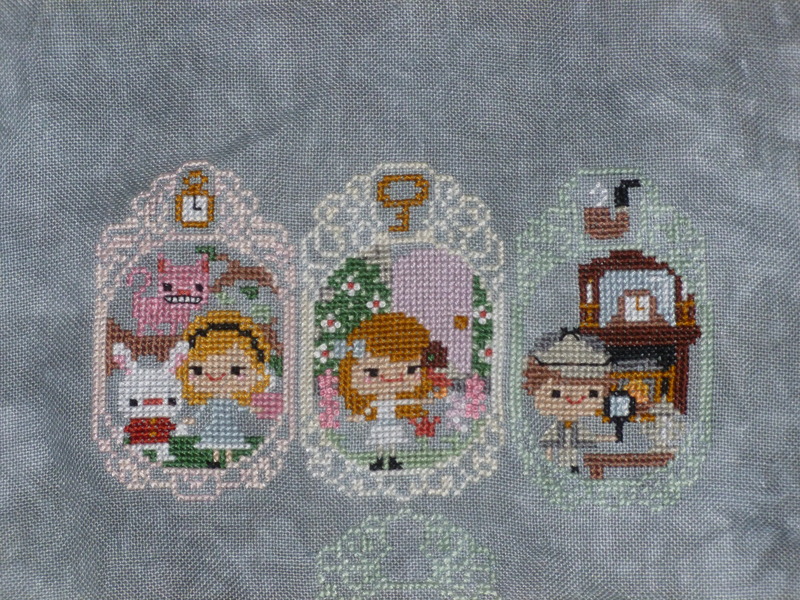 Alice in Wonderland, Secret Garden, Sherlock Holmes, Wizard of Oz, and Charlotte’s Web. Serenity Harbor from By the Bay. I still need to fill in most of the water for part 5; I doubt I’ll finish before part 6 comes out in June. 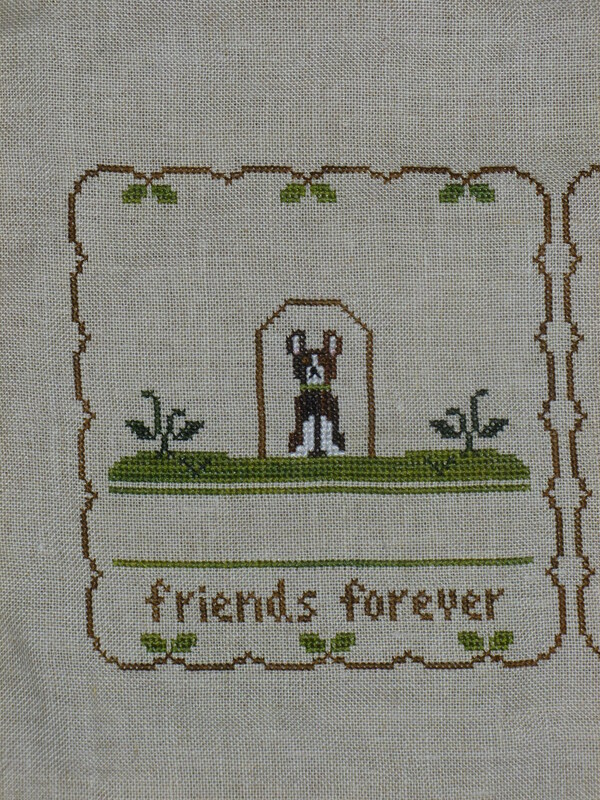 Furry Friends from Country Cottage Needleworks. This is a pretty personal project, so everything else is on hold until I finish. More to follow. I’m trying to work through some of the smaller projects in my stash, which means I’m probably going to fall behind on Serenity Harbor and probably won’t be able to catch up (the stitching is very dense all the way down to the bottom from here on out). That’s okay. I may have just bought more stash, so I need to clear out some space. Oops. The last few weeks of stitching were brought to you by Lost. Finished the last episode last night. I’m not entirely sure what happened for, like, any of it, but it was fun nonetheless. I haven’t decided what to watch next, so in the meantime I’ve got Breaking Bad playing in the background (again) until the next season of Orange is the New Black hits Netflix next month. If you have any suggestions, leave ’em in the comments. You may notice I changed the title. There isn’t really a story there; the old one just wasn’t fitting anymore. We’ll try this one on for a bit. I actually managed to do some stitching this month. The last week was a little rough (I pulled emptied a project bag on the table every night, but most nights I just put everything away again without a single stitch), but all in all I did okay. Out of season? Oh yes. I pulled the bonus pattern from Something Wicked out of my stash and finished it off. I started this back in the fall. Am I late, or am I early? I have yet to actually finished Something Wicked itself, but this was a step in the right direction. It’s a teeny bit slanted. Best I can tell, the tension was off. This fabric felt much looser than I’m used to, and since I don’t use a hoop or frame, fabric tends to just do whatever it wants. Fabric is from Weeks. 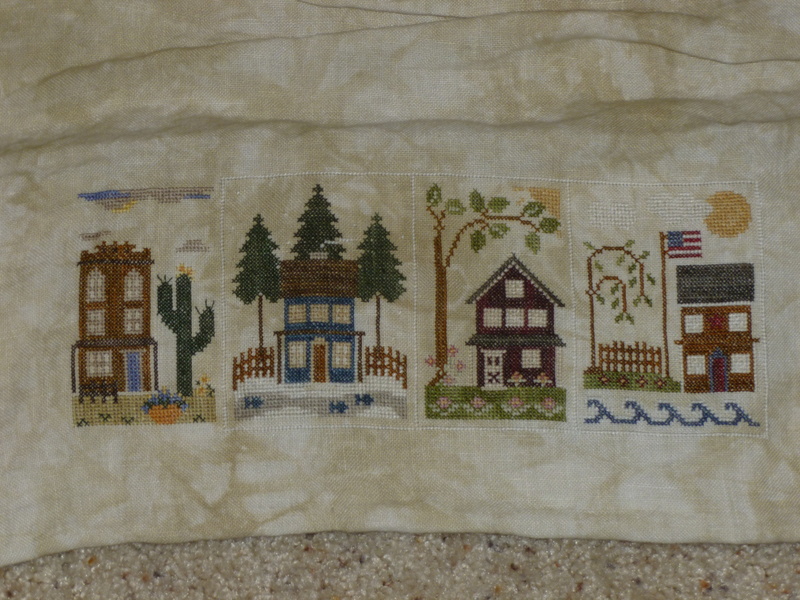 I started working on From Sea to Shining Sea by Little House Needleworks. This is a series of six thread packs from Classic Colorworks. This is the finished center, called Mountains. Can I call it finished? The full piece sure isn’t, but that individual pattern is. 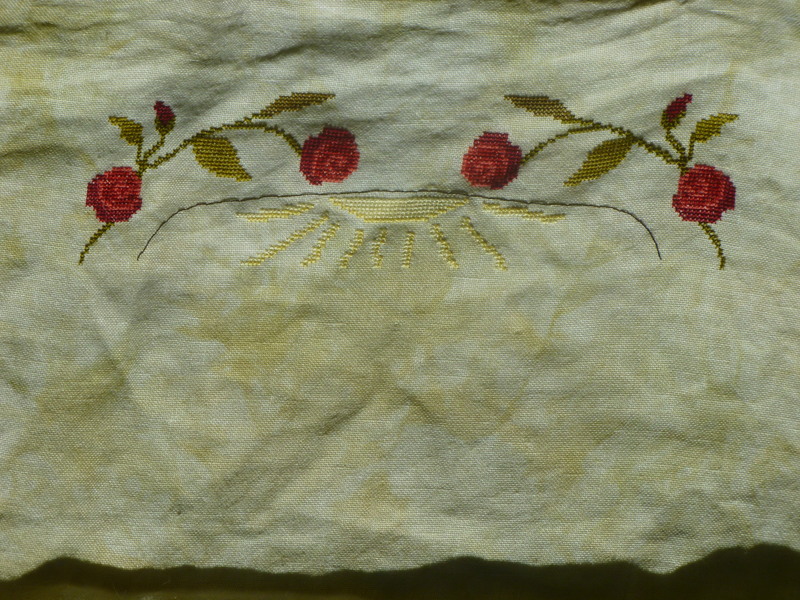 Fabric is Ancient (I think) by Picture This Plus, and the floss is hand dyed silk. 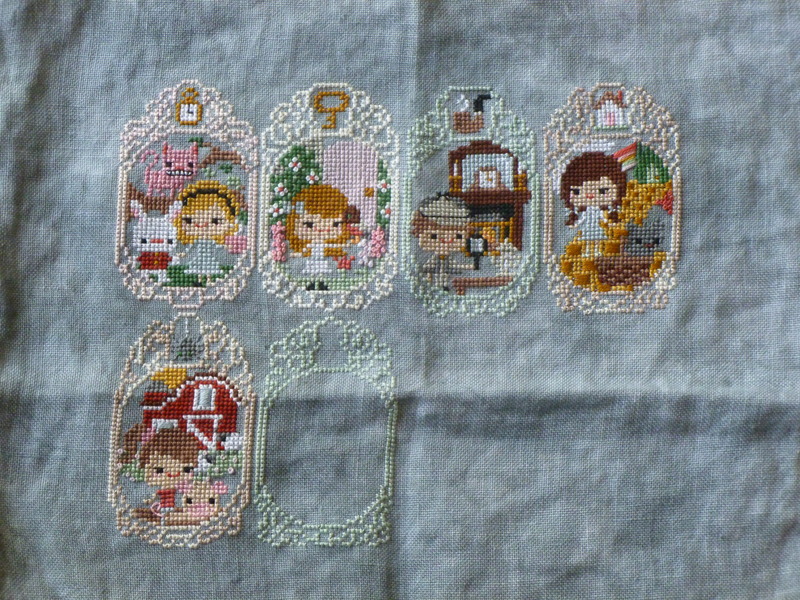 Once I finished the mountains, I took a break from the LHN piece because the new Story Time Sampler block was released. I give you Mr. Sherlock Holmes. Here are the first three months. Wait. Sherlock Holmes? That’s a perfect segue into the following kitten pictures! It’s like it was meant to be! Sherlock Holmes the cat knows from the threads of this blanket that the thief arrived in town Tuesday afternoon by train, and his shoes are Adidas. Why yes, Morty is in fact short for Moriarty. He looks all sweet and innocent in real life, but in almost every picture he looks evil and scheming. Coincidence? Not a chance. Ha! Almost forgot the WIPocalypse question. If money – and time – were not limiters, what projects would be on your stitching bucket list? I can’t think of any specific patterns, but I would stitch everything in silk and mount everything on Lone Elm Lane boxes. 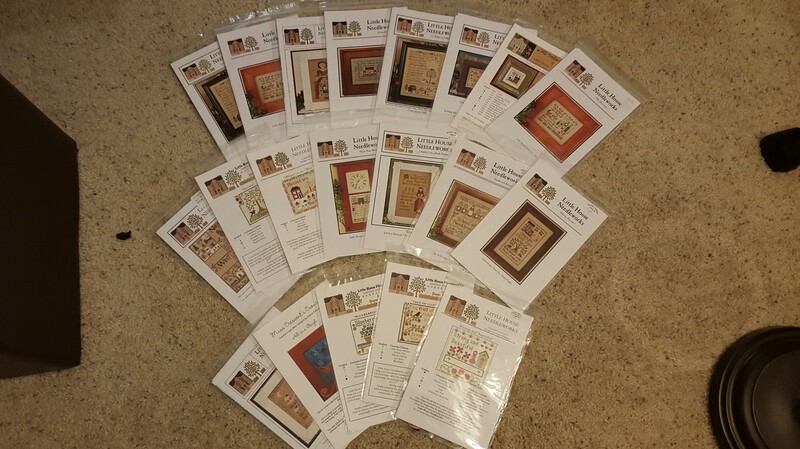 And then I would stitch the entire Little House Needleworks library. Or maybe just the pins. 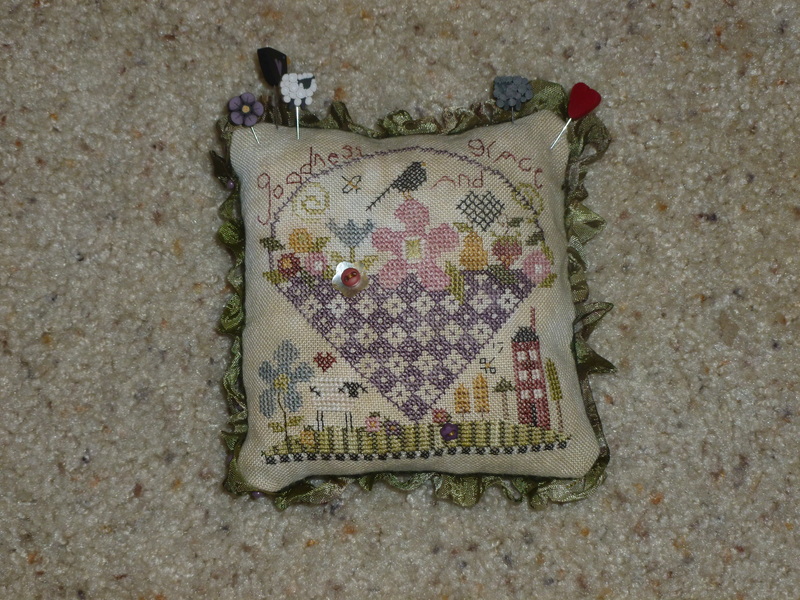 This weekend’s quick project was the Goodness and Grace pincushion from Shepherd’s Bush. The aforementioned needles come next, when I get around to the needle book. I had slightly better luck with the sewing machine this time. Did I tell the story of how painful the scissor fob was? How the stitching went okay, but I just couldn’t sew the thing together? Well, this one went much better. It’s still a little lumpy in places and the corners look odd, but I did manage to assemble it correctly this time. I admit I’ve been putting this one off partly because I didn’t know how I was going to put it together. I assembled the scissor fob right side out, but since this one has regular backing fabric, I knew that wasn’t going to work again. I have no natural affinity for the sewing machine. There is a reason I don’t quilt. I once tried to make a pillow case, and I only laughed to keep from crying. The full set is six pieces. I have the needle book in the queue, and I’m standing by for the other two. The entire series was supposed to finish in January. Suffice to say, we’re off schedule, but it’s just as bell because I have too many other things in my stash (and I have zero self control so the stash just keeps growing). I left my last post on something of a sour note, didn’t I? Let’s look at some pretty pictures to distract us. I haven’t actually read The Secret Garden, so I don’t have any witty remarks for this one. Oh wow, it’s February? How did that happen? Then again, in my mind it’s still October 2009. Oh February. 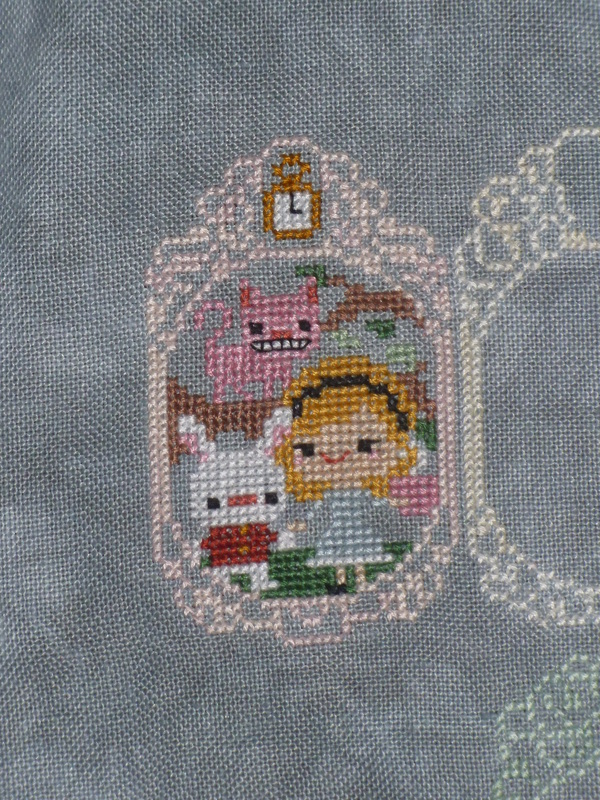 I haven’t posted in a few weeks and haven’t done much stitching since I finished the Alice and Co. block. 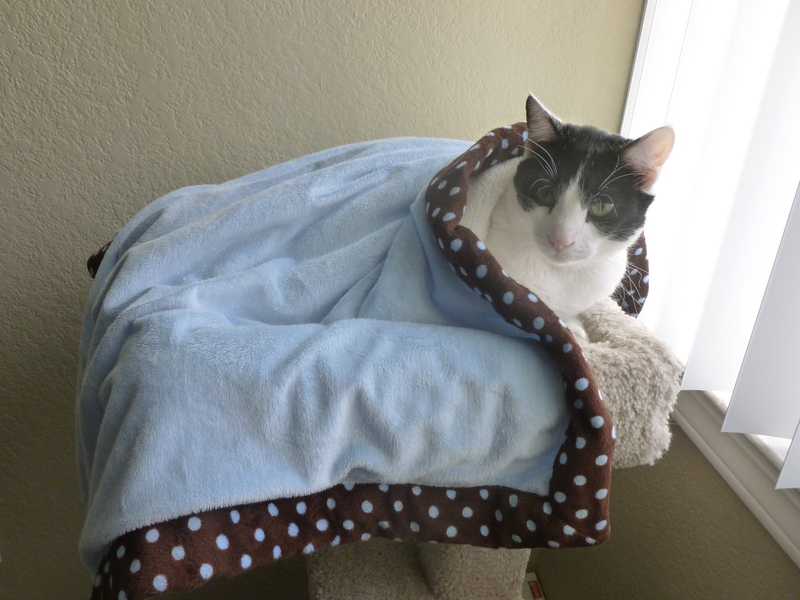 Sadly, one of the cats has been sick, and it’s exhausting being a grown up. He’ll be okay, but it’s a chronic problem that I’ll have to actively manage for the rest of his life. In general, the cats have been good about rolling with the punches, but our daily routine has changed just enough that all three of us are pissed off at each other. I didn’t fully appreciate how big this pattern was until I unfolded the fabric all the way. 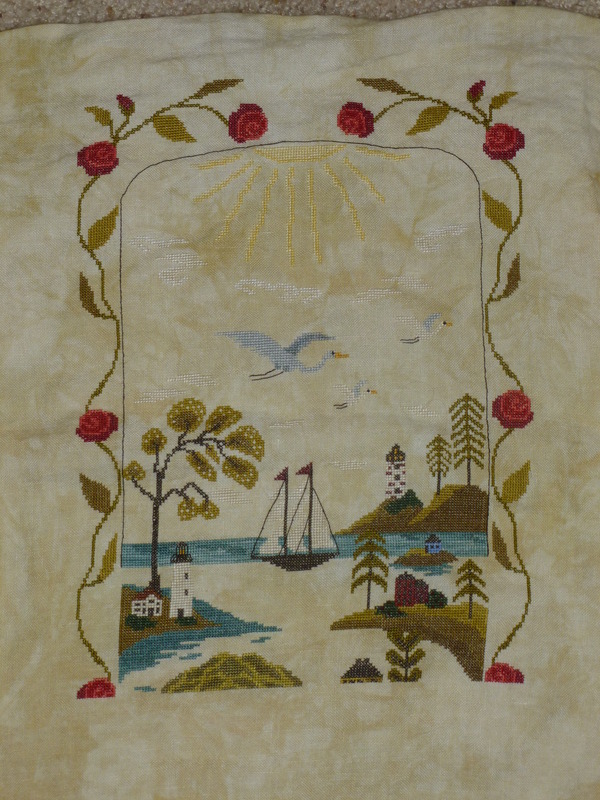 That’s the first part of Serenity Harbor, stitched with one strand of silk over two on 36 ct. linen. 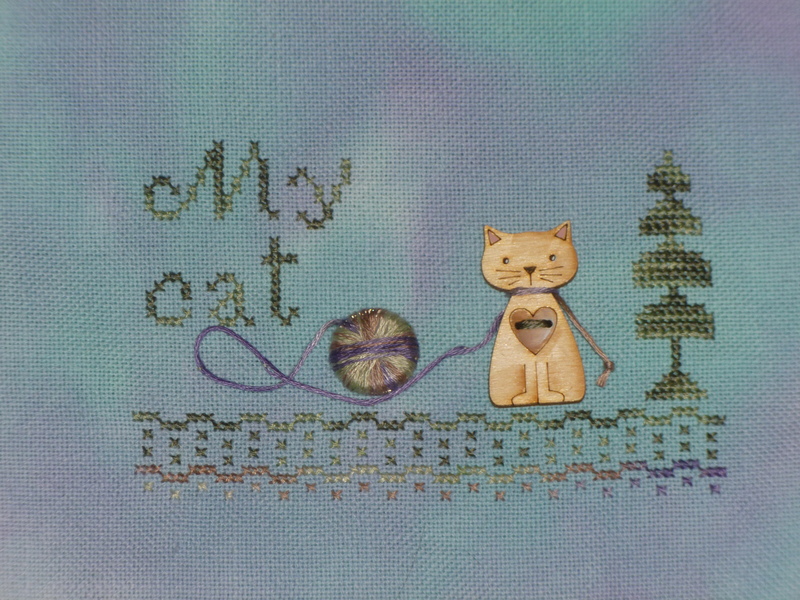 This is my piece for the Stitchy Start blog. February’s WIPocalypse question is: How do you overcome that feeling that you’re in a rut with a particular project? I have to walk away. 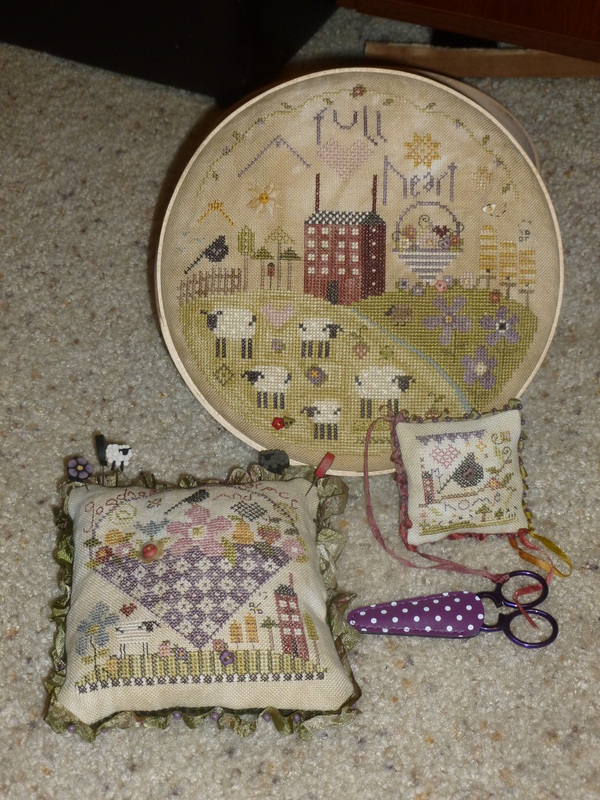 I try not to have too many projects going on at once, so I usually stop stitching for a few weeks. I go do something else, go outside for some fresh air. After a bit, I’ll come back and jump right back in. If a project is really hurting, I might just pack it away and move onto something else. I should write more, but in the meantime I have to go babysit two cats who won’t eat (one because I changed his food, and the other because he’s sad he can’t eat with his brother anymore). We’ll get through this. …to start the new Frosted Pumpkin SAL. Here’s Alice, the White Rabbit, and the ever creepy Cheshire Cat! I added the teeth to the Cat. I made the mistake of doing a google image search for the Cheshire Cat, and such things can never be unseen. Holy crap is that thing creepy. I like this one. This was a quick and easy stitch. I think the frames will be a little quicker than the Once Upon a Time border, and the blocks are about half the size. Fabric is Belfast linen in Storm by PTP, and floss is Weeks and Cosmo. The fabric doesn’t seem quite this dark in real life, but it’s a little tough to photograph right. Didn’t I say just yesterday I wasn’t going to buy anything new for my stash until I’ve worked through some of the backlog? Don’t worry, I haven’t bought it yet, but I’m being severely tested. Why? Because Sony gave permission for Blackbird Designs to distribute their “Yellow Submarine” pattern. I need it. Want? No. Need. Definitely need. Between the fact that it’s the Beatles (cue 1960s fangirl squeeee) and that I spent some time at sea, I need this pattern. For a while there, I didn’t think I would ever have the chance. The Magical Mystery Tour series of patterns is a good case study of the importance of copyright and trademark law, and I’m impressed with how Barb and Alma handled it. They made a mistake and corrected it, while other designers have blatantly disrespected the creative rights of others. Blackbird Designs solved this one the Right Way. A few months ago, they announced 6 new patterns to celebrate the 50th anniversary of the Beatles’ performance on the Ed Sullivan Show. Four of the patterns were good to go, but two had some hiccups. “Octopus’s Garden” contained copyrighted lyrics, and “Yellow Submarine” contained the trademarked image of the eponymous sub. When a shop owner pointed out the violations, Blackbird Designs immediately pulled the two patterns and contacted Startling Music, Ltd., and Sony ATV. “Octopus’s Garden” got the thumbs up back in October, and last week Alma announced that “Yellow Submarine” was also approved. Huzzahs all around! I think this is an important story. I see a lot of designs (on Etsy in particular, but scattered about everywhere) that draw on copyrighted and trademarked elements. Maybe some designers don’t understand the laws. Maybe some just don’t care. Whatever the case, they don’t confront the issue properly as Blackbird Designs did. They just keep selling. I remember one ironic moment when a designer who’s entire shop was built on trademark infringement found their patterns posted on someone else’s site. It was very uncomfortable, because the industry is severely hurting from illegal pattern sharing (cough Pinterest cough) but the designer was guilty of a similar violation. So kudos to Blackbird Designs, and congratulations on the happy resolution! I’m going to spend the next three days agonizing over my decision to stop adding to my stash. Inevitably, I’ll pull out my laptop in the middle of the night, resolution be darned, and buy it. After I click the button, I’ll say, “Oops. Nothing I can do about it now.” I’ve been through this scene before. The overwhelming majority of my stash was purposely bought in the middle of the night when I knew the logical side of my brain had checked out until morning. At least I’m predictable.